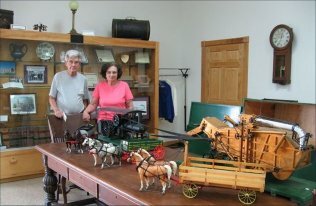 Founded in 1958, the Cedar County Historical Society celebrated its 50th Anniversary in 2008. Currently the society office is located in the Museum just north of Tipton. The society’s goal is to preserve and protect the history of Cedar County and her people for generations to come. Changing displays and permanent displays are available to the public from 10 a.m. to 4 p.m. Tuesdays and Thursdays and 10 a.m. to 2 p.m. Saturdays or by special appointment. Also available at the museum is a large research library, with microfilm of the Tipton Advertiser beginning in 1853 and Federal and State census records. The society is beginning a pioneer village on the museum grounds. An original log cabin from 1842, recently moved to the property, is the start of this exhibit. Future buildings will include a one-room school house, blacksmith shop, pioneer church, and more. 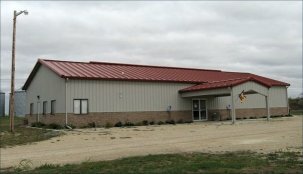 Be sure to visit us when you are in Cedar County! 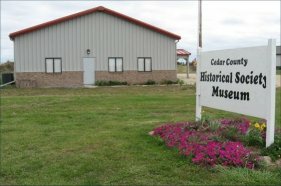 Cedar County Historical Society is a private non-profit corporation. Fees for research are $10 per hour with a one-hour minimum, plus costs of copies and postage, $5 per obituary plus copy and postage if the death date is provided. To belong to the society, dues are payable January l, of each year. Membership is $22 plus $3 for postage if you want the annual award-winning Historical Review magazine sent to your address. The magazines may also be picked up at the summer picnic or the museum. In addition to the Review, members receive a quarterly newsletter. To join, please send the following information with your check or money order to: CCHS, PO Box 254, Tipton IA 52772. Please use a separate piece of paper to explain the type of research you are requesting.